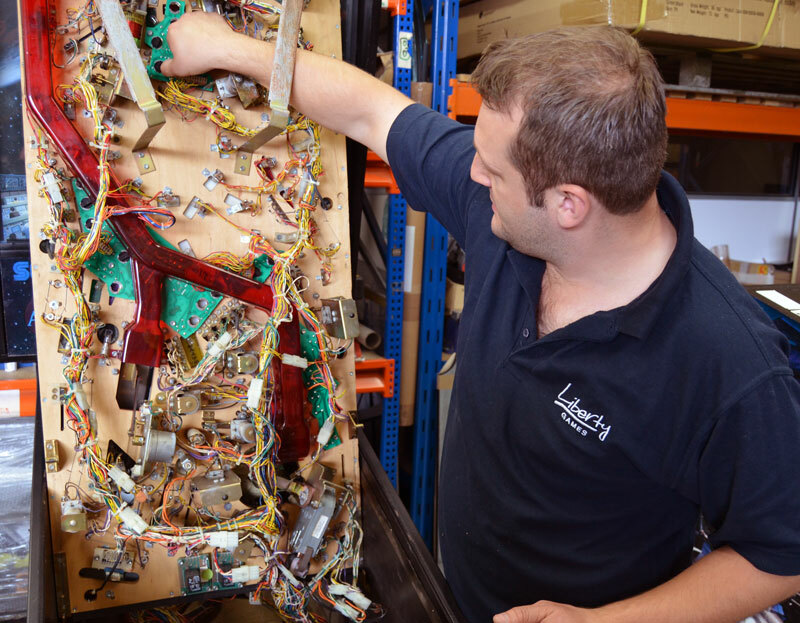 Each one of our reconditioned pinball machines is subject to a careful 25-point pre-delivery inspection process before being delivered to you. Many of the pinball machines we sell were made in the 1990s, 1980s or perhaps even earlier. We select our machines carefully and avoid those with faults, but even pristine, classic pins can be a little tired and in need of a service. We filter out unreliable machines during selection. Selected machines are then carefully serviced and inspected before delivery. We’re confident that our pinball machines are the best used examples around. Our comprehensive 12-month warranty is included with each machine used in a non-commercial environment – the same warranty as supplied with our brand new machines. This is a full parts and labour warranty, including the cost of technician visits if needed. So, if a gremlin develops in your machine, one of our technicians will be dispatched to iron it out. We ensure that the backboard folds properly and locks in place securely, and we inspect each of the bolts that attach the legs to the body. The whole machine must be stable and safe, and able to withstand many years of rigorous play. We check the condition of the paint and graphics all around the machine, replacing or repainting as necessary. We inspect and repair the body and trim to ensure top quality appearance. Our technicians inspect and replace the playfield and backboard glasses, if necessary, with UK safety glass. Painted surfaces including the legs, side rails and coin doors are sanded down and repainted if necessary. The playfield is stripped entirely and thoroughly cleaned with approved cleaning agents. Our technicians check every aspect of the playfield itself, including the plastics, targets, bumpers and other features. Ball runs are cleaned of dirt and grime and checked for obstructions, ensuring smooth, consistent ball performance across the playfield. Playfield features including toys, targets, ramps, bumpers and moving parts are checked for correct operation, and repaired or replaced if necessary. All lighting circuits, LEDs and backbox lighting are diagnostically checked and repaired if necessary. LED upgrade options are available, giving brighter lights and a longer, more reliable life. All switches, optoswitches and magnetic switches are tested with diagnostic procedures, and replaced if necessary. The flippers are removed and serviced, and the solenoids replaced if required at the same time. The flippers are refitted with new coil liners if necessary, set to factory specification, and checked for power. All batteries (if applicable) are replaced. Battery holders (if applicable) are inspected and replaced if needed. Corrosion often collects in these areas, which is removed and cleaned. All printed circuit boards are removed and inspected, and repaired or replaced if necessary. Flipper buttons, game start and launch buttons are inspected and replaced if necessary, with new microswitches if applicable. On the older contact-type buttons, carbon buildup is removed for smooth, responsive performance. The visual displays are fully tested. The machine is then run through built-in diagnostic processes to check repair work. The speakers and soundboard are checked for correct operation. Any worn or scratched pinballs are replaced with brand new items. The number and specification of pinballs included with each machine is checked. Our machines are supplied as free play as standard, but optional single and multi coin acceptors are available. The machine is fully reassembled methodically by our technicians, who double check each part of the machine as they go. Our technicians thoroughly play test the machine, checking flipper power, smooth ball runs, multiball operation and correct game mode progression. The machine is thoroughly cleaned of any lubricant residues, workshop dust and fingerprints from our technicians’ grubby fingers. We check the machine from top to bottom. We collapse the backboard and remove the legs, packaging the machine with bubble wrap, cellophane sheeting and padding, before organising your delivery.